The pictures don't show the size change but the jazz IIIs are about half the size of the Tortex and at 1.38mm almost 3x as thick! Why the change? I'm still doing these speed drills with my teacher and my right hand was noticeably keeping me from going faster. My teacher gave me a disclaimer: "I'll never tell you a piece of gear will make you a better player.... except these picks." and he handed me one. It's not a magic pick that makes you play faster, but offers a very fast release and great control. In other words, it doesn't slow you down or get in your way like other picks can. It was definitely weird at first, kind of feels like you're playing with a rock but I noticed better control right away. It took about a week to get used to, and it messed up my playing at the time, like one step backwards to go two steps forward. I wouldn't recommend trying them right before a gig. It makes my Tortex feel like a playing card in comparison. I thought I would go between the two picks based on the song but there's really no way, they're so different. Now that I've gotten used to the Jazz IIIs I find I can do all styles with them - not just single note picking like I originally though. Strumming's fine and the pick doesn't fly out of my hand like I thought it might! I really hadn't thought about picks or even tried a new one in 4-5 years. If you like yours, stick with it! If you notice you're lacking control in your right hand give the Jazz IIIs a try! Out of curiosity, what picks do you use?? Every guitar has those knobs down there, but do you ever use them? A month ago I would have said no, but a lots changed since then. I used to always set my volume at 10 and the tone knobs wherever they sounded good, then leave em' and forget about em'. Sometimes I played with the volume to see why the knob is there, but it always sounded bad at anything lower than 10. 1) The reason people use the volume knob is to adjust how much signal the overdive pedals or amp is getting. The stronger (more volume) the signal the more overdriven it will get. The opposite is true for weaker signals. If you roll the volume knob way down you can basically get a clean sound even with OD's turned on. 2) The reason it never sounded good below "10" was because I had set up my amp to sound best with my guitar at "10" so I had no where to go but down. If you set your volume to 7ish and set the gain/volume on your amp and pedal there you have more options. You can roll your volume up for a volume boost and a more OD for solos or parts you want to stand out, or roll the volume down for less OD. 3) There are a lot more sound pallets when you use the volume. I basically had different set levels of OD on my pedals - clean, low OD, hi gain, and boost. With the volume knob and pedals working together I can get every range in between. I always noticed a problem with low OD before, for single note stuff I wanted more OD but when I switched to strumming chords it was too much. The answer is to roll the volume up for single notes and down for chords. 4) The volume knob doesn't make a huge difference in total output volume from the amp. I was worried that turning the volume down would make the amp way quieter but that's not the case. It still gets louder and softer but not as much as you'd think. 5) Once you get used to it, you stop thinking about it. This hasn't happened to me yet, but people I talked to said changing the volume is second nature now. They're always listening to their tone and making small adjustments based on what they want it to sound like. 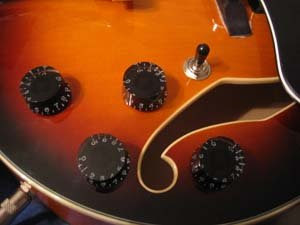 6) More people play with the volume than tone, but that doesn't mean the tone knob isn't important. It won't change the amount of OD but you can use the tone knobs to change the overall tone of your guitar. Ideally you would set your tone knobs at 10 and adjust the amp so it sounds as bright as you'd ever want it to sound, then roll the tone knobs back until they sound nice. Now if you want to really cut through you can turn the tone knobs higher and set them back when you don't. You can also lower the tone if you're playing something really mellow. Sorry to put two posts in a row with just a link, but I came across these again today and decided I should share. Go to youtube and search Hillsong Guitar Workshop. It's not the Hillsong United guys but Nigle from the "regular" hillsong goes through some of their songs and teaches the guitar parts. Hillsong does some of the United songs now so you can learn some of the united songs from the videos too. They're pretty cool. Give em a watch. They cover everything from the wood of the guitar to the speakers in the cabinet. They have super solid advice too. Lots of stuff I'd heard and even stuff that was news to me and make we want to go home and check it out! Most of your tone is in your hands but if you're equipment isn't working right or isn't set up to help you out, the tone will be lost. Enjoy. I'm the proud new owner of a 2001 G&L ASAT Bluesboy. G&L is a cool company started by Leo Fender (of Fender) after he sold Fender to CBS and after he worked with Music Man. Leo claimed G&L were the best instruments he ever made. They make good stuff. The model I got is essentially a high end Tele but instead of two single coils, has a seth lover humbucker in the bridge. I'm blown away by the range of sounds it can make! The tone knob has a lot of usable sounds for each pickup combination and each pickup sounds good. It can go from creamy blues to twang with the flip of a switch and the roll of the tone knob. Am I getting rid of my blue ES-137? No. I've always been a gibson guy, and while I LOVE the sound of a gibson, they really only get one tone. Don't get me wrong, I love that tone, but I want some extra versatility. Right now I'm using two guitars - the ES-137 and a Gibson Les Paul (the brown one in the picture at the top of this site). They sound really similar so instead of having two guitars that sound similar I figured I'd replace the Les Paul and have two different sounding guitars. Also I got spoiled by the nice neck of the ES-137. The Les Paul is mostly rough mahogany with a light satin finish. Compared to the ES-137 it fees like I chopped down a tree and put some strings on it. The G&L has a super smooth glossed neck and nicely rounded frets. It's buttery!! Why this model? I wanted the fender sound but I personally think strats are too thin sounding for what I play. 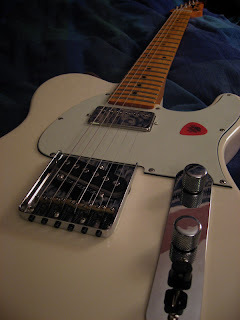 I tried every model of Fender Tele and G&L ASAT and this was my favorite. I liked the necks on G&Ls better than Fenders too, they're thinner and fit my hand better. I guess I'll find out in a few weeks how much I really love it. So far so good. The only problem I ran into is the metal box around the bridge. I usually rest my right hand on the strings I'm not playing when I do lead stuff and it felt weird rubbing on the metal. I'm sure my hand will find it's place after a while though. I mentioned these chords or intervals in yesterdays post and it got brought up again in the comments, so here's a post devoted to them! I don't really like that worship is a genre of music but I'm going to pass over that discussion today because for better or for worse, these chords are really iconic in worship music. Sometimes if feels like cheating or copping out because they're so over done, but they really do make a nice atmospheric sound. I 100% expect to hear these chords with a nice dotted eighth note delay at the gates of heaven. I have a feeling everyone has their own style and variation on these, so I'll list mine and I'd love to get other people's interpretations in the comments section. All my examples are in the key of G and will pretty much work over any chord progression in G. I'm not putting any rhythms down, just the changes. Generally I would play each chord for one measure or whatever works with the chord changes of the song. There you have it! The basic shapes of ambient worship guitar. The Mary had a Little Lamb of worship music. What shapes do you use? I found these chords worked great when you want something in the middle register to add some drive. They might sound a little funky if you play them on your own because they don't always start on the root note. Trust me though, when you have a bass playing the root notes they make more sense. These chords work best in the keys of G, A, and B. F and E might be getting low and C and D might be getting high. For A just slide these up two frets and for B slide up four. Try using these on the chorus of Might to Save or Marvelous Light!